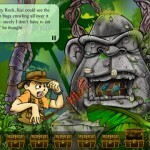 Treasure Kai is a series of book apps designed for kids 5 to 10 years old. Currently there are two apps in the series. Kai is a boy who likes treasure hunt. In each book app, he goes to a different adventure. 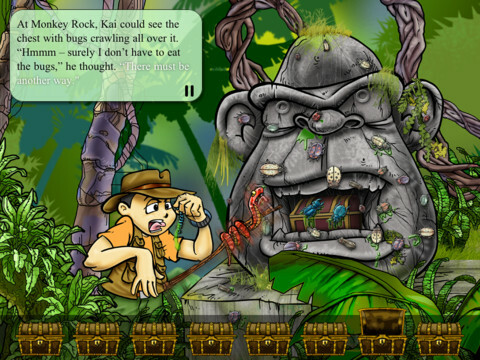 In the first book app, The Lost Gold of Shark Island, Kai takes kids to the treasure hunt on a desert island. In the 2nd book app, The Seven Cities of Gold, Kai goes back in history to race Francisco Coronado to find the seven lost cities of gold. A nice feature of the apps is the “choose your own path” format. In the first app, kids can pick, among 8 treasure boxes, which one they want to open first. Each one reveals a different clue that leads to a different path. In the 2nd app, the 8 treasure boxes are replaced by 7 keys, each opens a different city. Since there are so many different choices, kids can come back to read the app again and again, and each time it is a different story. This is a great way to engage young readers, especially reluctant readers. On each page of the app, there are some interaction features. My favorite are the bouncing soccer ball and the lamp that is turned on or off from touch. These features, however, blend with the story very well. Kids are not distracted from the content. The app is narrated professionally. If you want the children to read by themselves, you can go to the feature button on the top-right corner, and turn off “narration”. You can also adjust volume for the music and sound effects. Treasure Kai series has intriguing stories with good balance between interactive features and story contents. The “choose your own path” feature builds children’s interest to come back to the story, again and again. It is a great series for young imaginative minds. The first app, The Lost Gold of Shark Island, is available for iPhone, iPod, and iPAD. It is $3.99 on App Store. The 2nd app, The Seven Cities of Gold, is only available on iPAD. It is $4.99 on App Store. Thanks for sharing such great apps! Children everywhere will benefit. You are welcome. There are so many good educational apps other there, however there are more that are not so educational. It is hard to find the good ones. My goal is to help the busy parents to find the good ones! My daughter loves the Treasure Kai apps. Thanks for sharing the review about #2. I think it just went live last week or so. Well worth the money! They are very engaging apps. It is time to get #2! I am sure he will enjoy the app. Thanks for this recommendation. Grandguy #1 will love it. His name is Kai. Ha, make sure check it out!